A Black Lives Matter protester named April Goggans disrupted the United States Conference of Mayors on Wednesday in Washington D.C. to call for Chicago Mayor Rahm Emanuel’s resignation. Goggans waded onstage with a “Resign Rahm” sign and calmly stood there as a variety of people in suits tried awkwardly to get her to leave. Goggans appeared onstage during a speech by Baltimore Mayor Stephanie Rawlings-Blake. 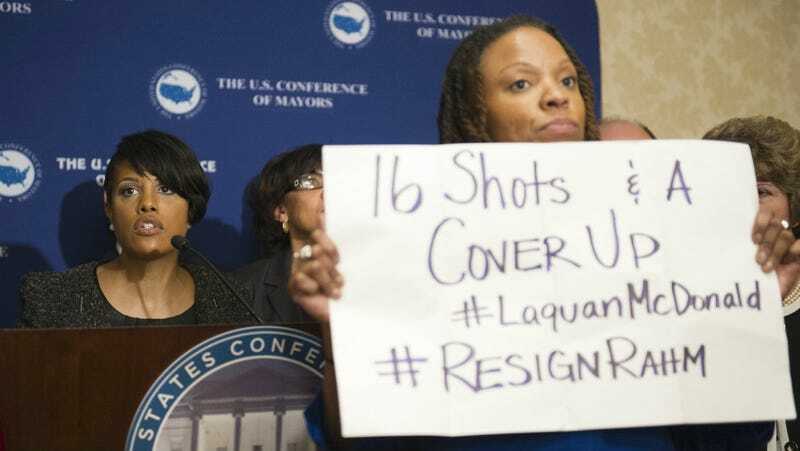 She held a sign reading “16 Shots & a Cover-up #LaquanMcDonald #ResignRahm.” McDonald, 17, was shot 16 times by Chicago police officer Jason Van Dyke in October 2014. Emanuel fought to prevent the release of a very damning dashcam video of the incident; Van Dyke was not indicted until 13 months after the killing. The mayors and mayor-adjacent people onstage tugged Goggans’ sleeve, patted her shoulder, and then eventually tried to pretend as though she wasn’t there. Rawlings-Blake eventually continued her speech as though nothing was going on. Emanuel is, of course, also at the mayors’ conference, where he is evidently not really going to discuss the McDonald controversy at all, or the fact that the U.S. Department of Justice is now investigating the Chicago police. Goggans responded cheerily Wednesday night to her keyboard critics who thought she shouldn’t have gotten on that stage.